Etiquette Advantage in Business 2 Edition As today's workplace becomes increasingly more competitive, knowing how to behave can make the difference between getting ahead and getting left behind. 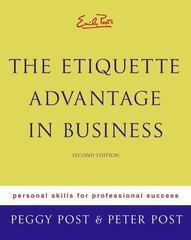 In The Etiquette Advantage in Business, 2nd Edition, etiquette authorities Peggy Post and Peter Post provide you with the all-important tools for building solid, productive relationships with your business associates -- relationships that will help propel you and your company straight to the top.In this completely revised and updated edition, which includes three new chapters on ethics, table manners, and electronic communication, the Posts show you how to handle both everyday and unusual situations that are essential to professional and personal success -- from resolving business conflicts with ease and grace to getting along with your boss and coworkers; from making long-lasting contacts to winning clients and closing deals. They also offer up-to-date guidance on pressing issues such as harassment in the workplace, worker privacy, e-mail dos and don'ts, and knowing how and when to shoulder blame.Written for business workers of all types and backgrounds, The Etiquette Advantage in Business remains the definitive resource for timeless advice on business entertaining, written communication, dressing appropriately for any business occasion, conventions and trade shows, job searches and interviews, gift-giving, and overseas travel.No matter the situation in which you find yourself, the Posts will give you the confidence to meet the challenges of the work world with confidence and poise -- because today, more than ever, good manners mean good business.